The previous two articles were about your child's self-worth and dealing with acceptance or rejection from others. In this article, you will read about how to get your child to care and be motivated to do things. As your child heads into the teenage years, he will question more about what goes on around him. No longer will he do things just because he’s told to do it. His thinking is taking on a logical turn so it has to make sense to him why he must do something. For this reason, your teen may not see how school work or house work relates to him. He doesn’t get how Calculus, Shakespeare or having a clean room will have any significance in his life. And so he starts to not care about the things that you know will be important for him. You can use incentives such as rewards or punishment as a motivator to get your child to do something but it won’t always work in the long term. This is because the motivation to do something due to a reward is external, it’s coming from outside of your child. The stronger and longer lasting motivation is when it’s something internal to your child. This is what will make him want to do it by himself. 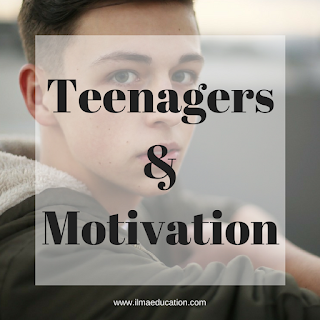 These are some things that you can do to help trigger your teen’s intrinsic motivation. If your child can see the benefits of what he has to do then he’ll more likely do it. It’s the bigger picture of doing work and getting good grades rather than the specifics of the subjects. Okay, so understanding Shakespeare won’t help him when he’s designing computer games but by studying Shakespeare he’ll pass the required units of study to get the mark to enter university to study computer programming. Let your child experience the logical consequence of doing or not doing what he’s supposed to. So if he doesn’t do his homework then he’ll get detention or fail his test. When he experiences this, he’ll know that if he wants to avoid the same experience then he has to do his homework. Where possible, give your child a choice of things to do. Can he choose which subjects he wants to study? Which chores from your list would he like to be responsible for? Would he like to do his homework straight after school or after dinner? By giving choices, your child will likely be more motivated since he had a say in it.